Along the mediterranean coast, 60km west of Algiers, lie the ruins of the ancient Roman city of Tipasa. This is one of the most significant and beautiful Roman archaeological sites in Algeria. 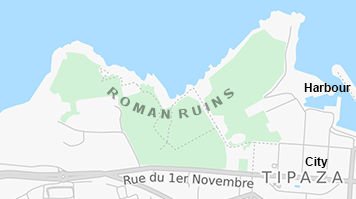 The ruins are in a gorgeous setting in a park along the rocky coast and extend for 2-3 km from west to east, although the actual archaeological park is spread around a bay over a distance of less than 1 km. 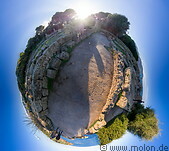 The ruins are embedded in a maritime forest of pine trees and date back to ancient Punic times. In the 2nd century BC Tipasa was conquered by Rome. The Romans surrounded Tipasa with a 2200m long and 8m high wall. During the Roman period Tipasa was a significant Roman colony in northern Africa. The Vandals destroyed Tipasa in 430 AD. Tipasa has been a UNESCO World heritage site since 2002. There are a few hotels (bookable via the international booking portals) in or around Tipasa. In practice however most tourists choose to stay in Algiers and visit Tipasa on day trips from Algiers.